The funny & witty advertisements by QUIKR on TV would tempt anyone to try their fate on QUIKR.COM. After all , everyone is looking for their perfect match- ALL THE TIME! Buyer Aur Seller ka Perfect Matchmaker? Lets find out if I met my match. Blogadda invited me to SPEND Rs.5000 on QUIKR this Diwali. Let me tell you I was on cloud 9 at the thought of spending Rs.5000. 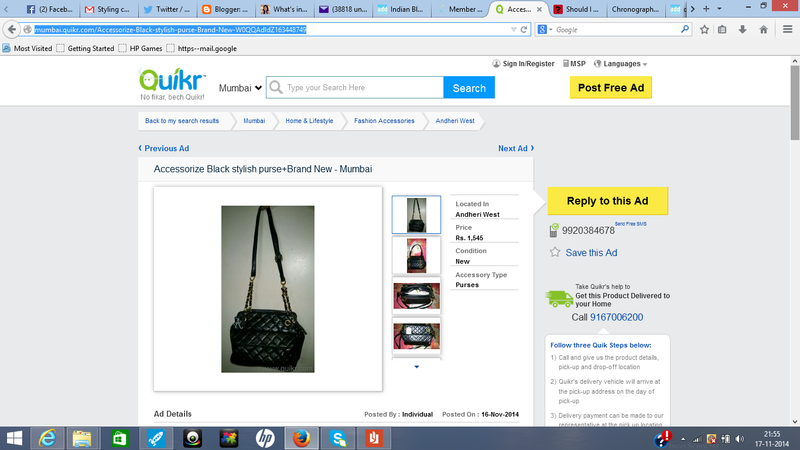 But when I began searching Quikr , I felt like I am in a fool's paradise. I didn't know what to do with the 5000 Rs.I had to find my perfect match in 4 days! This is when I shut down my PC & went back to bed thinking about all things I keep wishing for. It just struck me , I wanted a branded watch which adds elegance to my formal dressing at work. 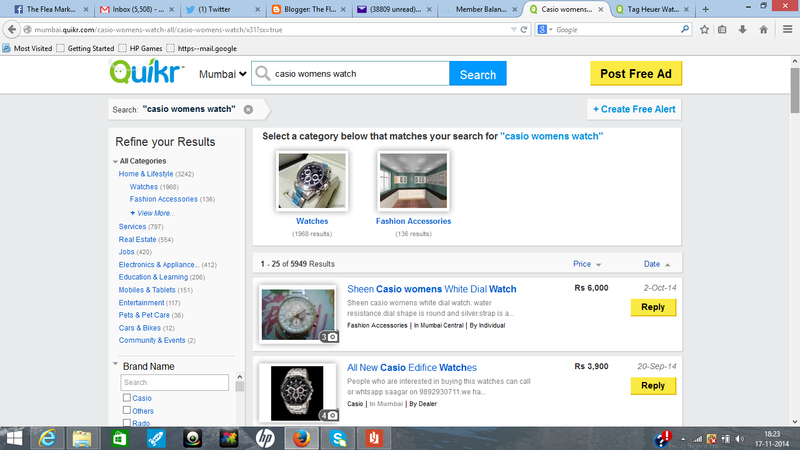 I didnt mind using an expensive branded watch if it was maintained well.I found this Casio watch after I added the keyword "CASIO" (as I am fond of casio watches) listed for Rs.6000. 1. The phone number of buyer was listed. 2. 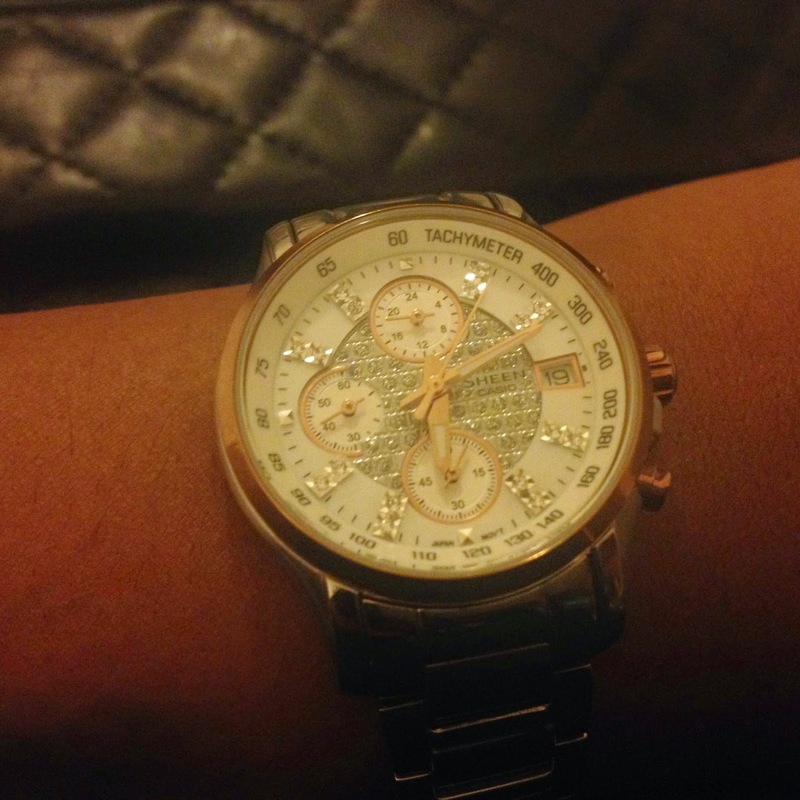 I called and asked seller (hereafter referred to as "Emma" ) to send clearer pictures of the watch. 4. Our houses were far, so Emma said she will send a guy with the watch & I pay him if I like it . 5. I was to pay Rs.150 even if I didnt buy the watch to compensate for the courier charges. 6. 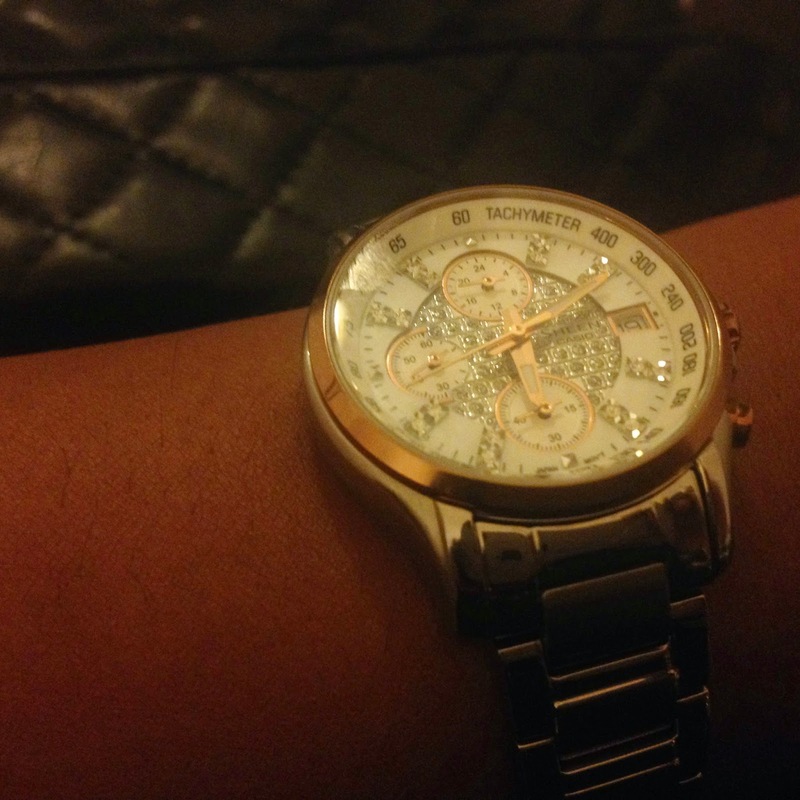 I saw the watch, fell in love & instantly paid Rs.3150 for it. The Fool's paradise turned out to be a paradise for me. 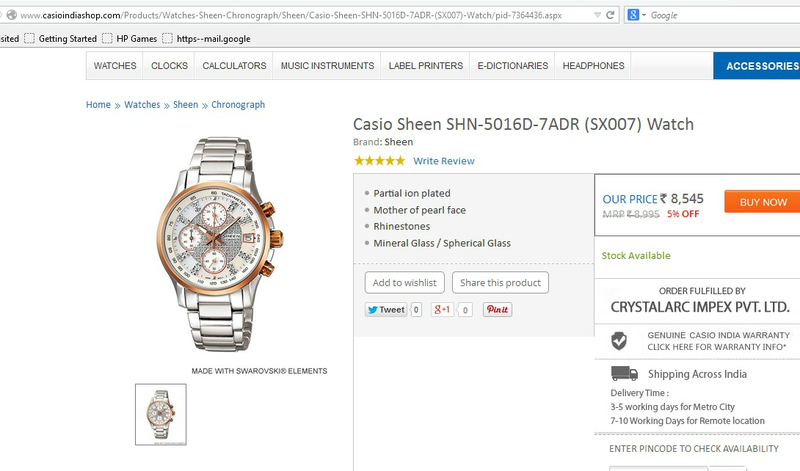 Look at the watch specifics on casio website , this one is indeed special .Priced at Rs.9000 and studded with swarovski elements on a mother of pearl dial. It looks as new as possible! QUIKR has done something , I could never imagine. Could you? And 5 stars to the amazing seller who was so cooperative. And yes, I am on cloud 9 , totally! But wait, I was to spend 5000Rs and instead of exceeding by 1000Rs as I feared; I am left with 2000 more. Damn! I had fewer options for my next purchase as I didnt want to over-spend! 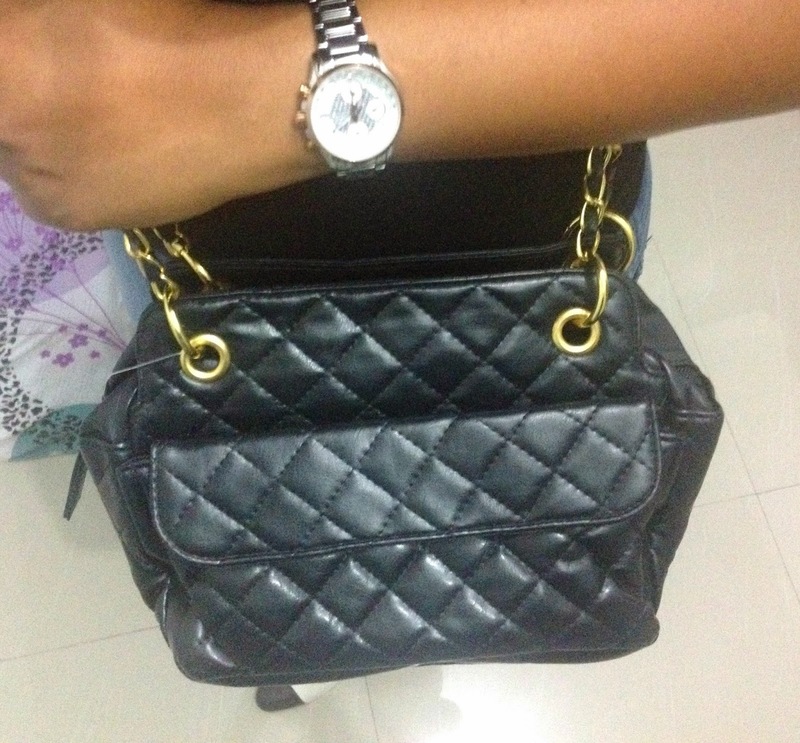 I turned to the handbag section as I am a handbag hoarder, I shamelessly fell for this quilted Accessorize beauty. 2. The buyer told me reiterating from listing that this bag was bought from Accessorize store in Singapore Airport -Terminal 2 on 21st July, 2013 and that he still has the tags intact ,however he has lost the bill. 3. I enquired on price (listed as 1545Rs) but since it was SGD 44 ( Rs.2000 as per conversion, he said it was already discounted. I did not want to argue much as I thought the bag looked really nice. 4. He agreed to courier me the bag after I pay him online . Since courier amount was Rs.60 , He adjusted and made total to 1560INR. 5. I received the bag in 2 days. To be frank, I was disappointed because the bag looked smaller than I imagined from the photos. It also had a 30$ tag along with 44$ tag which meant it might be on discount. Even if it wasn't on discount, I felt it was a lossy deal as the bag hardware in gold was losing its color. I probably did not negotiate well on this one. Nonetheless , a fine bag to use when you go out shopping. 1. Be sure of what you want before you hit Quikr, or the options will confuse you. 2. Always talk to the seller on phone and not through mails/messaged. I noticed my first purchase was fantastic because I spoke to he seller personally to tell her what my expectation was. When buying 2nd hand products, its important to set your expectations. 3. Always insist on a way in which you may turn down the product if its not upto the mark. You can mutually agree on the terms. For example, in my watch purchase I was clear that if I do not like the watch i will pay only for the courier guy's delivery charge. 4. Ask for more photos of the product in case you do not intend to follow the RETURN route. Also ask the seller to wear the product and click so that an estimate of product size is obtained. 5. QUIKR can be a boon if you follow all above steps! Go there if you have the courage to wear a second hand premium product. There are dealers too, but i did not try. My name is Dorene Zeller, I am from United State. Have you been looking for a loan?Do you need an urgent personal or business loan?contact Dennis Hopkins Finance Home he help me with a loan of $300.000 some days ago after been scammed of $2500 from a woman claiming to be a loan lender but i thank God today that i got my loan worth $300.000.Feel free to contact the company for a genuine financial service. Email:dennishopkins_financehome@live.com or http://www.dennishopkinsfinancehome.com/ or dennishopkins69@yahoo.com or Tel: USA +12404374240 Skype ID:roger.n.william Tel:UK+447509546091.He is a trust worthy man. Hello My name is Mrs Grace I want to thank Mr Morris for helping me with my loan funds of $170,000.00. If you are interested in a loan please contact him so that he can also help you too his loan do not take long in 24 hours time my loan was in my account anyone that need an urgent and trusted loan should contact him now he is a God sent and a good person his email is. mikemorrisfinancegroup@gmail.com I am happy to write this here because there are many peopel out there that need this help too. if you really need help without been delay as I was delay before this is the right loan company to contact without delay: Email: mikemorrisfinancegroup@gmail.com And they are located in the European part of the world. are you sure you have loan with them ?????? ?